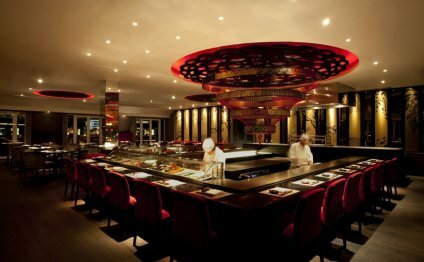 Just a few doorways up from Wagamama, on Wimbledon’s hectic shopping strip, sits another Asian chain eaterie. But this one’s some various. Sticks n Sushi has-been imported from Denmark, where there are ten branches; many design elements into the cavernous area allude to its Scandinavian beginnings – like the comfortable wooden chairs. The sticks, or skewers, are safe and western-friendly: no gizzards, cartilage or any other more uncomfortable cuts. They’re good adequate, though chicken tsukune had much more in accordance with a Swedish meatball than everything you’d discover in a skewer in Japan. The sushi rolls include gimmicky names and colourful coatings – such as ‘Black Alaska’ inside-out moves spread with black colored tobiko (flying fish roe) and filled with salmon, cream-cheese and avocado; or ‘Dreamy California’ filled with miso aïoli and crabsticks, after that rolled with chilli flakes and poppy seeds. Vegetarians won’t feel left out as there are many vegetable sushi choices and edges; sweet tomato pieces with onion, soy and vinegar dressing is a tasty snack. With friendly staff, a youthful vibe with no shortage of seating, this can be an enjoyable venue for which to take pleasure from well-priced platters and cocktails on a lively balancing with pals.